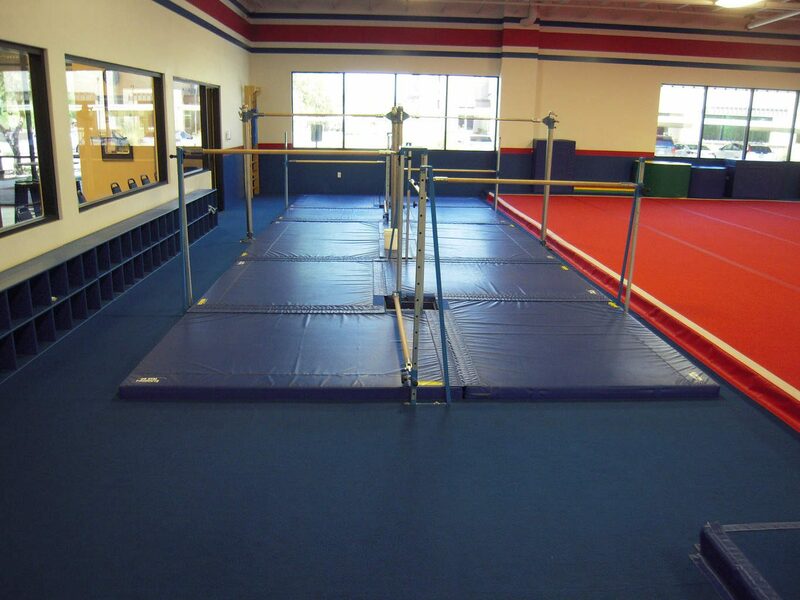 Queen Creek, AZ was a growing area in need of a gymnastics facility and USA Youth Fitness Center was the perfect fit. 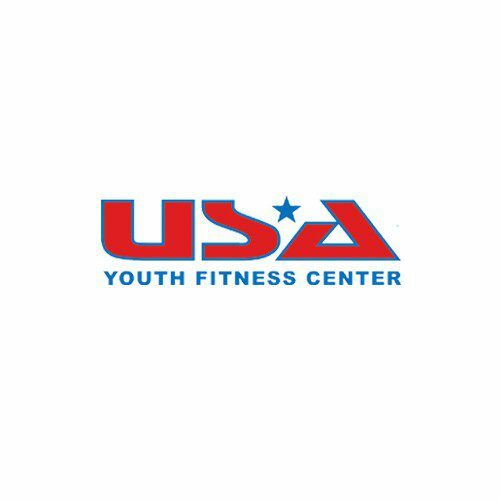 Located only 30 minutes away from USA Youth Fitness Center’s other 2 facilities, a satellite gym for this growing city made sense. 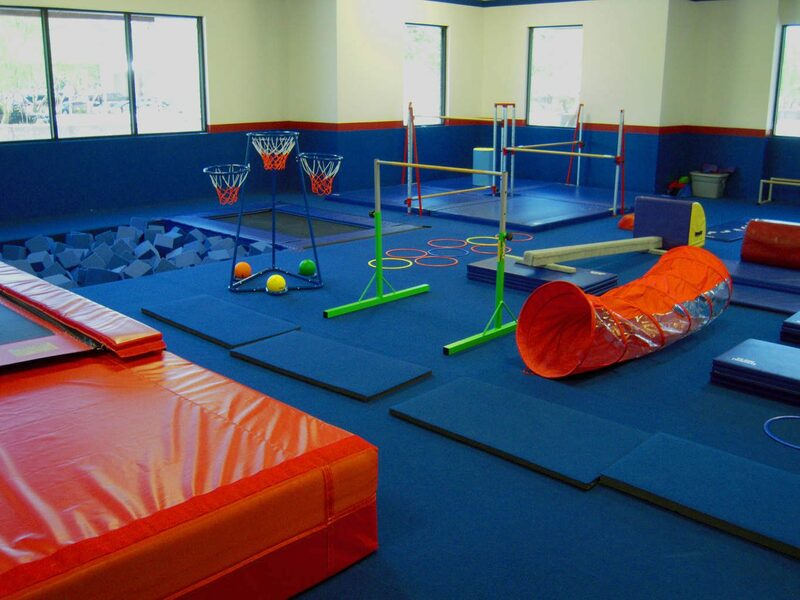 Designed as a feeder gym to work with kids from preschool up to Level 5. 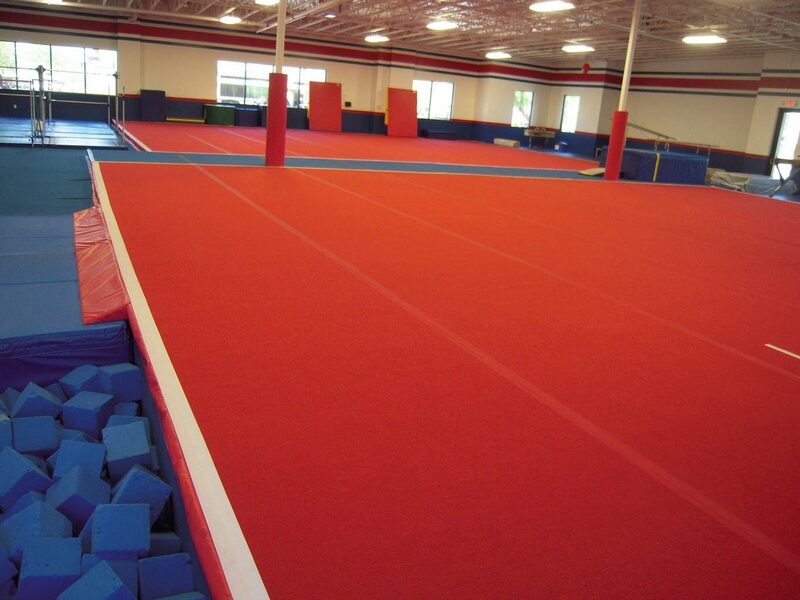 US Gym Product’s responsibilities included design consultation, supplying all equipment & matting as well as full installation. 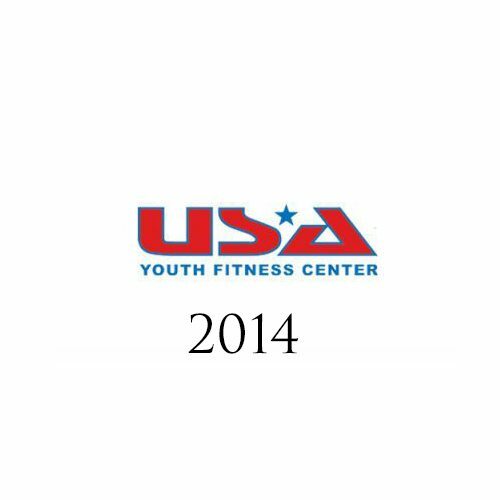 The fist and most obvious difference between USA Youth Fitness Center facilities is the entire gym area is always padded. All the walking surfaces as well as spaces between equipment are covered in 1-3/8″ CBF. 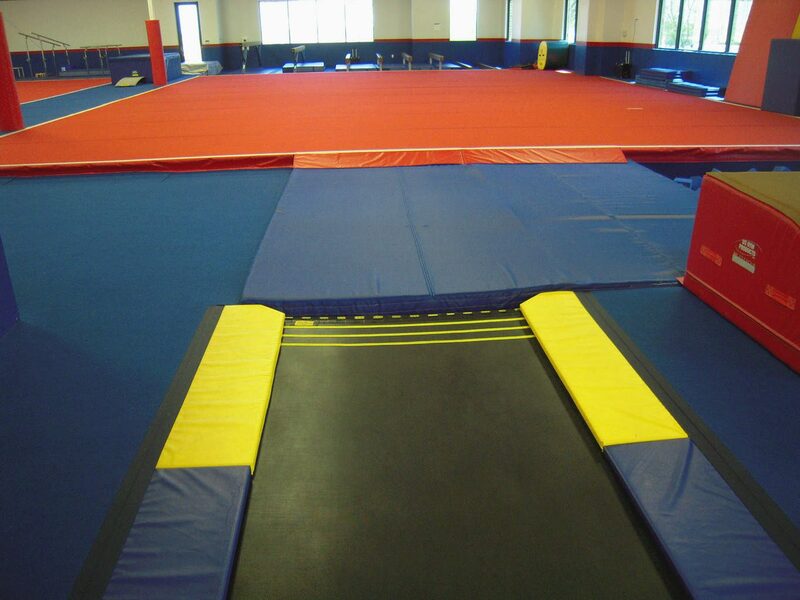 This keeps the gym as safe as possible and also provides a nice soft walking surface for the kids. 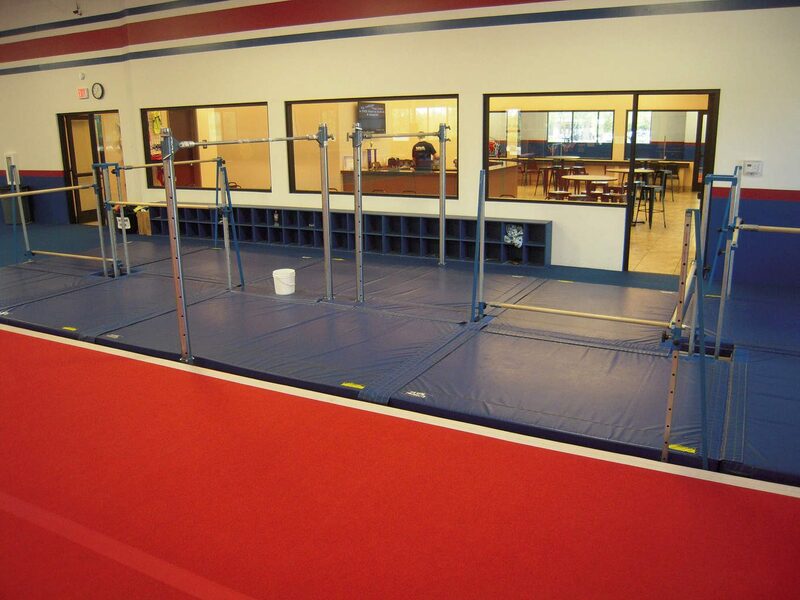 This is also where US Gym Products sets itself apart with our unique custom installation work. As you can see all the intricate cuts that were made to make this CBF fit tightly against the door frame and walls around it. Not so easily seen in the picture is the sloped edge that transitions from the 1-3/8″ CBF down to the door threshold. That way there is no lip to trip on as people come in and out of the gym. The massive low bar system which includes two quad bar systems and two cableless single bar trainers are evident upon entering the gym. This area also features custom padding that connects everything together seamlessly, creating an extremely safe area for kids. Just beyond the bar area is a massive 5,000 sq.ft. spring floor. 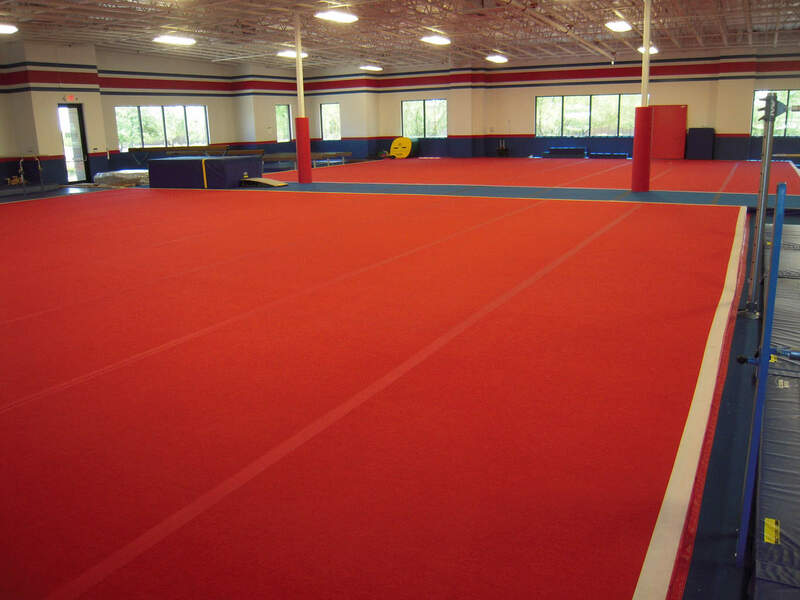 The floor is divided into two red 54x42 cheer floors with a blue tumbling strip in between them. 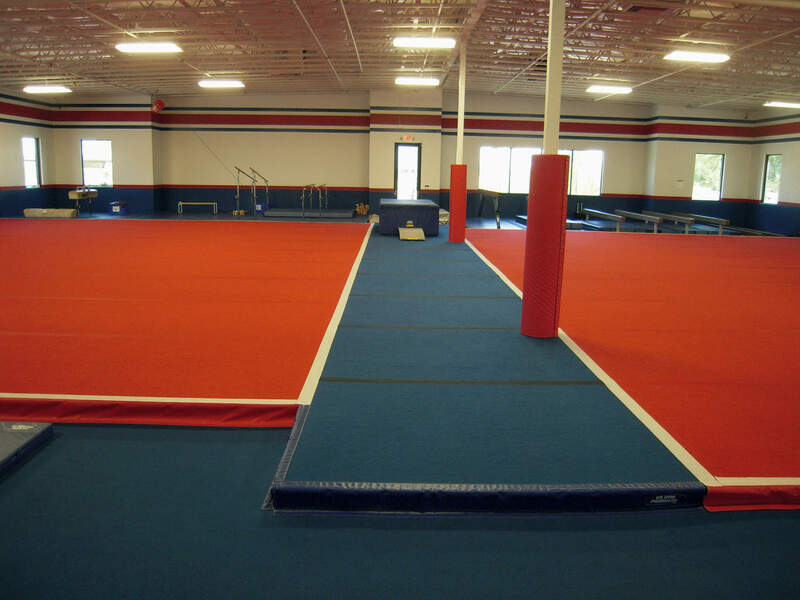 The tumbling strip can also be used as a Level 3 vaulting area. On the far side of the spring floor is the beam and parallel bar area. 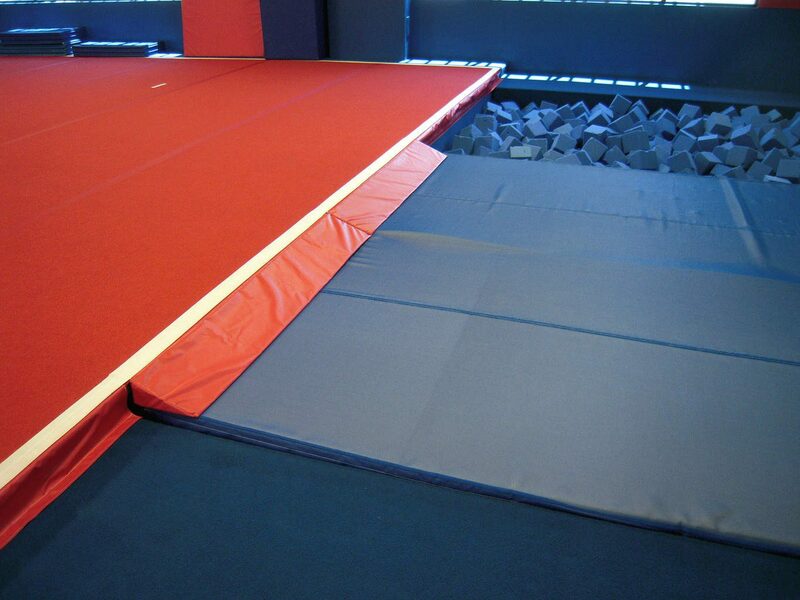 The right spring floor has access to both a resi pit and deep foam pit. 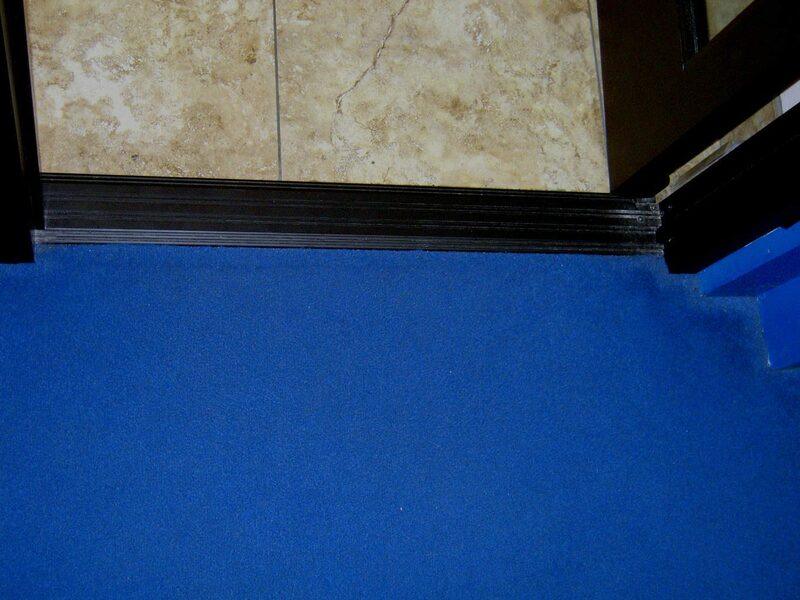 A custom made skirting attaches the spring floor to the padding flooring around the gym. Also a special wedge going from the spring floor into the resi pit makes this area extra safe. 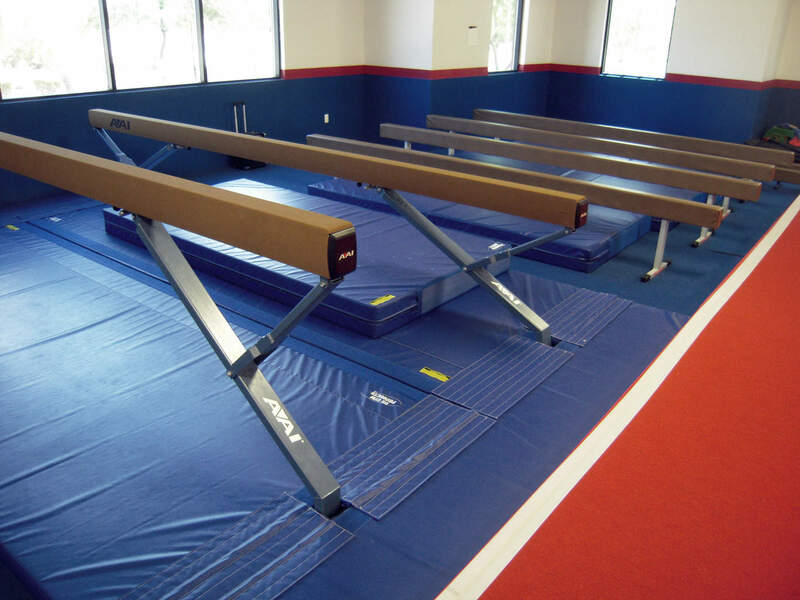 Sharing the spring floor pits is an inground 40′ Tumbl Trak and a vault runway that can go into either the resi or deep foam pit via a vault trainer. We also added in custom yellow end pads for the Tumbl Trak for extra safety. On the other side of the gym are the trampoline and preschool area. 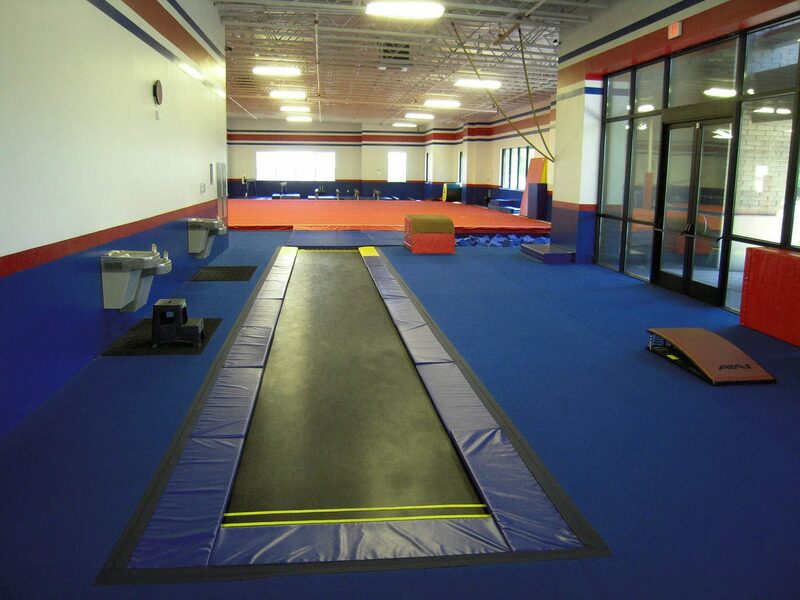 This area features (2) 7x14 inground trampolines w/ custom padding as well as some overhead rings. Beyond the red and blue wall in the left picture lies the preschool area. This area has its own entryway into the gym as well as a 28″ tall padded wall separating it from the rest of the gym to help keep the preschoolers safe and prevent them from wandering into the main gym. 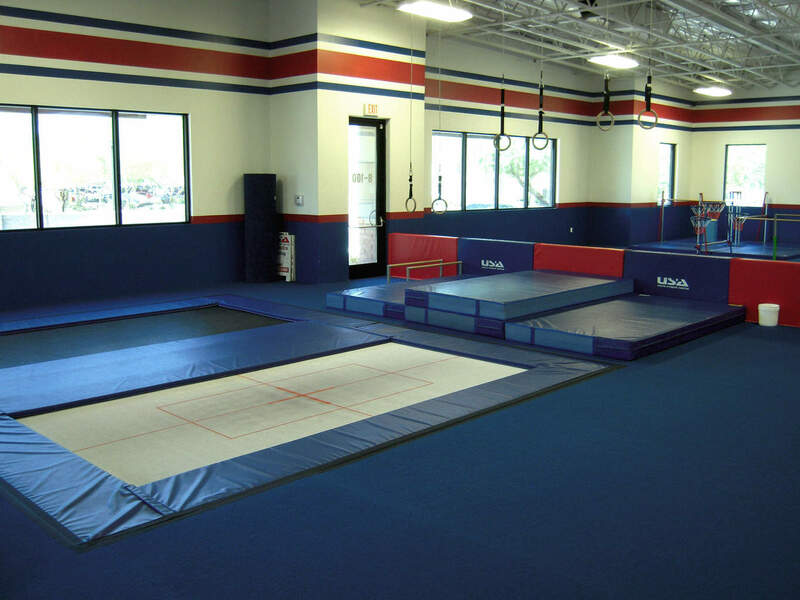 Queen Creek, AZ was a growing area in need of a gymnastics facility and USA Youth Fitness Center was the perfect fit. This facility was designed as a feeder gym to work with kids from preschool up to Level 5.